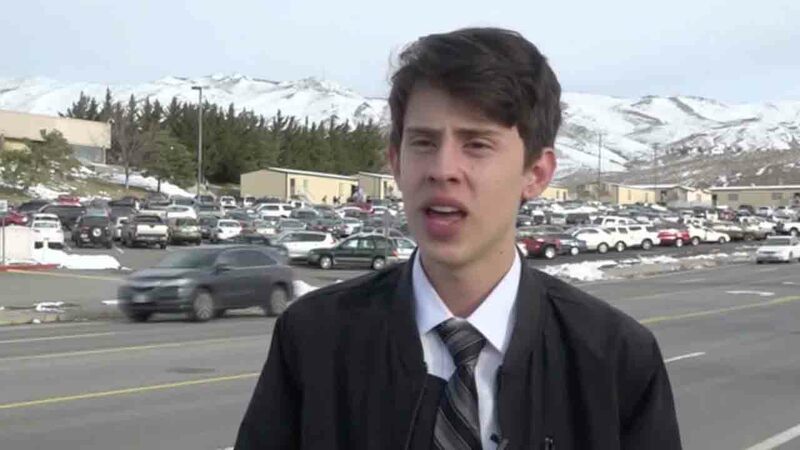 RENO, N.V. -- School officials in Nevada are taking some heat after suspending a 17-year-old student after a congressman complained about a call the student made to his office. The American Civil Liberties Union (ACLU) of Nevada on Monday sent a letter to the Washoe County School District demanding that McQueen High School in Reno overturn a two-day suspension imposed last week on student Noah Christiansen, ABC affiliate KVUE reports. The school claims the junior was being disciplined after using "disrespectful behavior/language" during a phone call to the office of Rep. Mark Amodei, R-Nev. The ACLU sent a similar letter to Amodei calling on the Republican congressman to withdraw the complaint his office lodged with McQueen and apologize to Christiansen. Reports show the student spoke with an office staffer during a national student walkout protesting legislative inaction on gun control in the wake of the deadly shooting at a high school in Parkland, Florida. During the 17-minute walkout, Christiansen said he called Amodei's office and asked that the congressman vote to make bump stocks illegal. He also requested that they raise the minimum age to buy a gun from 18 years to 21 years. The teen admitted to using an expletive while telling a staffer that Congresspeople needed to do something about gun control. Yet, the aspiring attorney said that didn't warrant a suspension. "I'm smart enough to use better words than the f-word," Christiansen said. "At the same time, even if I do want to use those words, it's my right to do so." "It is unbelievable that a constituent should have to worry about calling a congressional office to share their opinions because your congressman's office might retaliate against you by reporting you to your school or place of employment," Tod Story, ACLU of Nevada's executive director, said in a statement. "The retaliation by Congressman Amodei's office is a betrayal of the First Amendment and of the representative process. Read the full story on KVUE's website.